There’s one anime I see many posts about. One anime that merges beautiful art, music and adolescence together. I actually watched it till the end and enjoyed it along the way. And I’ve mostly been a fan of things with a lot of fantasy and a lot of place to dream except if it was more of less typical but Shigatsu wa Kimi no Uso was fairly special. This anime seems to touch everyone’s heart in one way or another; it could be about Kousei’s past, Kaori’s current situation, Bittersweet love, Love of music or any other thing. The combination of all these things into one story could seem much but in this beautiful show it isn’t. It gives off a atmosphere of dreams that anything is possible and that time is limited so try hard and live in the moment because it won’t last forever. At least that’s what I feel. That’s why this is a good watch for anyone of any age! Sure not everyone will enjoy it or like it, because won’t cha know, not everyone is willing to try other types of anime. Surely not Slice of Life. However, because not everyone has a pretty blonde to make them realize that life is short, maybe it would be good to watch this just to gain a bit more of an appreciation on life. There are many amazing quotes too; that make you feel both melancholic and happy and thankful all at the same time. Those are the types of words I want to be in my own manga and novels. I want words with meaning and foundation which support the art in its beauty and happiness. I want that emotional roller coaster that some people fear. And even if I close my eyes sometimes I want to see those train wrecks that turn into something much more than a bad situation! Anyways, I’m getting off topic. It’s not the most exciting anime ever, but this anime causes tears and smiles and more. But even so it’s an anime you can think about. Ask a lot of why’s. Sometimes you want to scream that life is not fair! And wish to be talented at something( though you have to work hard even if you’re talented). But most importantly the happiness you’ll feel as you watch this slice of life. Plus it might bring back memories of a childhood love. Though sometimes it feels nice to just be the characters and let it sink in; All the emotions. Plus, Kousei, as a character really grew because of Kaori. She was his light and that’s what she wanted to become from him. She made him take chances like jumping off of a bridge (not in a bad way) without being forced like the first time when he was with Tsubaki. It’s just great like that. Thought the ending is something that really tore up the Kokoro. Everyone at some point probably expected her to actually live. So did I, at some point, but because of my horrible power of predicting the inevitable I knew that it wasn’t going to be so. When I saw that she had died I was sad but also relieved but also angry. *Sad because she died and my ship didn’t sail fully. *Relieved because it wasn’t cliché with a bs reason why she survived which might have ruined the whole point of the series ( in my opinion) and a bit because my powers were right. The last show that I remember nullifying my power was Tokyo Mew Mew. In my defense, I didn’t expect much from Aoyama! Geez, it was no fair. *Angry because they both loved each other all this time and they weren’t an item. It was interesting and sad and agrivating. I mean, I know she loved him and not Watari. It was fairly obvious. But I wanted more from them together. 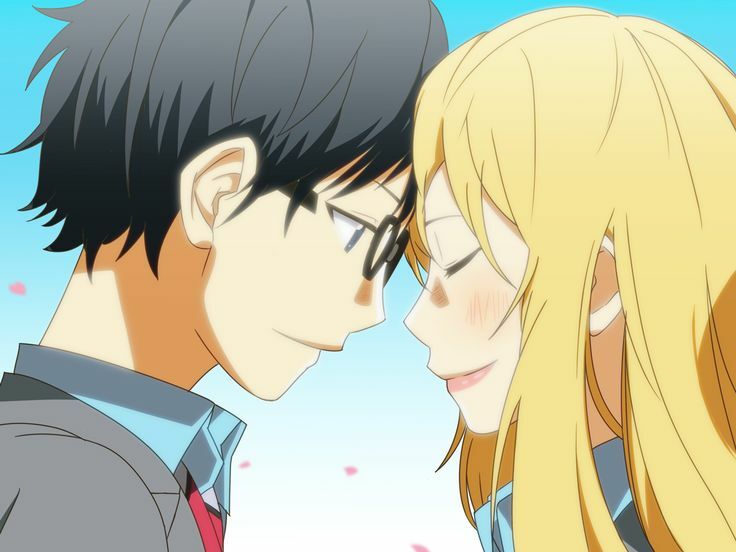 It’s okay though… Even if they aren’t together Kaori is permanently engraved on Kousei’s heart. She wants it that way too. She pored out her love for him; all that time that she knew she was dying she tried to help him and give him hope again which brought about something beautiful. She didn’t leave him without anything left to live for. She actually never left him at all. Even in the end. As cliché as it may sound she will always live in his heart as the person he probably loves the most. Was I able to live inside someone’s heart? Was I able to live inside your heart? Do you think you’ll remember me at least a little? You’d better not hit “reset!” Don’t forget me, okay? That’s a promise, okay? I’m glad it’s you, after all. Will I reach you? I hope I can reach you.